I cannot tell you how thrilled and honored I am to introduce to you today two very special people in the world of livin’ la vida low-carb. This husband and wife team works tirelessly promoting the principles of low-carb living that we cherish so dearly because of the changes they have made in our lives with weight loss and improved health. Of course I’m talking about Drs. Michael & Mary Dan Eades! I recently named them one of my low-carb movers & shakers of 2006 because they really are literally on the frontlines of promoting the healthy low-carb lifestyle to the masses through their books, television show, public appearances and blogs. Be sure to visit the official web site for the Eades at ProteinPower.com as well as the always thought-provoking personal blogs of both Dr. Mike and Dr. Mary Dan. 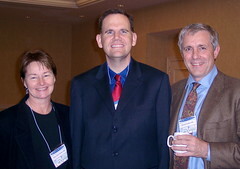 I had the distinct privilege of meeting them in Brooklyn, New York at the low-carb science conference that was held there. You’ll never meet two more gracious people who have opened themselves up to a world looking for answers about their weight and health problems. I think you will quickly sense that in my interview with them today. Find out what the Eades really think about “low-carb,” the criticisms that people continue to launch at this healthy lifestyle despite scientific research supporting it, why they are excited about 2007 being the year low-carb makes a comeback, and the surprising reason why low-fat diet guru Dr. Dean Ornish refuses to agree to a debate about low-carb by clicking here.